With a number of world-famous Coron tourist attractions to see, preparing for a Coron Palawan itinerary should be easy. The trick is to come prepared especially if you’re traveling on a budget. While Coron Palawan is not an expensive Philippine destination, you wouldn’t want to spend more than you intended to, do you? To help you make the most of your adventure, here’s a Coron Palawan itinerary guide to get you started. Whether you’re coming from Manila, Puerto Princesa or El Nido, here’s a comprehensive travel guide on how to get to Coron Palawan. The best way to get to Coron is to fly from Manila. Philippine Airlines and Cebu Pacific have regular direct flights from Manila to Coron Palawan. Take advantage of promo fares, which both airlines offer regularly. Once at the airport, ride a van going to Coron town. Then hail a tricycle going to your Coron Palawan hotel. In this Coron Palawan itinerary guide, we’ve included a short list of the best budget and mid-range hotels in Coron you should check out. Coron Underwater Garden Resort – With rates as low as Php 3,100 per night, this is ideal for budget travelers. This is one of the best mid-range hotels in Coron, which offers easy access to most of the famous Coron attractions. 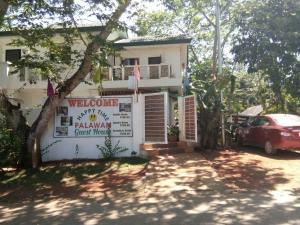 Micasa Lodge Palawan – This is another budget Palawan hotel that’s close to the many attractions in Coron. Room rates start as low as Php 1,900 per night. Coron Westown Resort – If you want to stay at an upscale Coron Palawan resort that doesn’t cost a lot, then Coron Weston Resort is highly recommended. Room rates start at Php 3,0o0 per night and the resort is fully equipped with amenities that can make your stay in Coron even more relaxing. Corto del Mar Hotel – Located within the town proper and with room rates starting at Php 4,000 per night, this is the best Coron Palawan hotel if you want a comfortable stay with close proximity to the best restaurants and bars in the island. If you’re on a really tight budget and you want to save more on hotels, here are the cheapest Coron Palawan accommodations under Php 300 per pax per night. Kayangan Lake – A picturesque lake known for being the cleanest lake in the county. Twin Lagoon – These two lagoons are beautiful. Although getting to the other lagoon requires a bit of an effort, the effort is definitely worth it. Malcapuya Island – One of the many islands in Palawan that has fine and powdery white sands. Barracuda Lake – If you want to see barracudas swimming up close, then you should visit this lake. Sunken Japanese Wrecks – Diving enthusiasts should include wreck diving in their Coron Palawan itinerary. The island is famous for the Japanese shipwrecks that sunk during the WWII. Smith Beach – This beach may be small in size, but it’s definitely worth a visit. It has soft white sands with crystal clear waters, not to mention a serene and relaxing atmosphere. Calauit Safari Park – Want a change of scenery after exploring the many islands, lakes, and lagoons of Coron? Then head over to the Calauit safari park and mingle with the giraffes and zebras roaming freely around the park. By now, you should have an idea on how to get to Coron, where to stay in Coron, and what to do in Coron. Now, let’s talk about your travel budget. The typical budget for a 4-day 3-night stay in Coron Palawan ranges from Php 5000 to 8,000 inclusive of accommodation (Php 500/day) but exclusive of airfare. If you’re not going to join Coron Palawan tours and you just want to feast your eyes on the beauty of Coron, you’ll be able to live on a Php 700 per day budget (probably). Ready for Your Coron Palawan Adventure? If you can visit only one destination in Palawan then Coron island is definitely your best bet. And since we’ve already got your Coron island itinerary covered, you have no excuse. So, treat yourself. Plan your Coron Palawan trip and we promise you won’t regret it.